For other people with similar names, see Elizabeth Stuart and Elisabeth of Bohemia (disambiguation). Elizabeth was born at Dunfermline Palace, Fife, on 19 August 1596 at 2 o'clock in the morning. King James rode to the bedside from Callendar, where he was attending the wedding of the Earl of Orkney. At the time of her birth, her father was King of Scots only. Named in honour of Queen Elizabeth I of England, the young Elizabeth was christened on 28 November 1596 in the Chapel Royal at Holyroodhouse. During her early life in Scotland, Elizabeth was brought up at Linlithgow Palace, "one of the grandest of Scotland’s royal residences", where she was placed in the care of Lord Livingstone and his wife, Eleanor Hay. A couple of years later the king's second daughter, Margaret, was placed in their care as well. Elizabeth "did not pay particular attention to this younger sister", as even at this young age her affections were with her brother, Henry. When Elizabeth I, the Queen of England, died in 1603, Elizabeth Stuart's father, James, succeeded to the thrones of both England and Ireland. 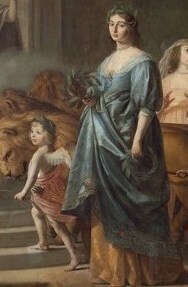 Along with her elder brother, Henry, Elizabeth made the journey south toward England with her mother "in a triumphal progress of perpetual entertainment". Elizabeth remained at court for a few weeks, but "there is no evidence that she was present at her parents' coronation" on 25 July 1603. It seems likely that by this time the royal children already had been removed to Oatlands, an old Tudor hunting lodge near Weybridge. On 19 October 1603 "an order was issued under the privy seal announcing that the King had thought fit to commit the keeping and education of the Lady Elizabeth to the Lord Harrington [sic] and his wife". Under the care of Lord Harington at Coombe Abbey, Elizabeth met Anne Dudley, with whom she was to strike up a lifelong friendship. Part of the intent of the Gunpowder Plot of 1605 was to assassinate Elizabeth's father and the Protestant aristocracy, kidnap the nine-year-old Elizabeth from Coombe Abbey, and place her on the throne of England – and presumably the thrones of Ireland and Scotland – as a Catholic monarch. The conspirators chose Elizabeth after considering the other available options. Prince Henry, it was believed, would perish alongside his father. Charles was seen as too feeble (having only just learnt to walk) and Mary too young. Elizabeth, on the other hand, had already attended formal functions, and the conspirators knew that "she could fulfil a ceremonial role despite her comparative youth". The conspirators aimed to cause an uprising in the Midlands to coincide with the explosion in London and at this point secure Elizabeth's accession as a puppet queen. She would then be brought up as a Catholic and later married to a Catholic bridegroom. The plot failed when the conspirators were betrayed and Guy Fawkes was caught by the King's soldiers before he was able to ignite the powder. Elizabeth was given a comprehensive education for a princess at that time. This education included instruction in natural history, geography, theology, languages, writing, history, music, and dancing. She was denied instruction in the classics as her father believed that "Latin had the unfortunate effect of making women more cunning". By the age of 12, Elizabeth was fluent in several languages, including French, "which she spoke with ease and grace" and would later use to converse with her husband. She also was an excellent rider, had a thorough understanding of the Protestant religion, and had an aptitude for writing letters that "sounded sincere and never stilted". She also was extremely literary and "several mementoes of her early love of books exist". Each suitor brought to the proposed marriage the prospect of power and greatness for the young Elizabeth. Marriage would cost Elizabeth her father and her father’s kingdom. When James had succeeded to the English throne in 1603, England had acquired a new role in European affairs. Unlike the childless Elizabeth I, James, by simply "having children, could play an important role in dynastic politics". The selection of Elizabeth's spouse, therefore, had little to do with her personal preference and a great deal to do with the benefits the match could bring. Most of her suitors were rejected quickly for a variety of reasons. Some simply were not of high enough birth, had no real prospects to offer, or in the case of Gustavus Adolphus, who on all other grounds seemed like a perfect match, because "his country was at war with Queen Anne’s native Denmark". Furthermore, England could not face another religious revolution, and therefore the religious pre-requisite was paramount. The man chosen was Frederick (Friedrich) V, Count Palatine of the Rhine. Frederick was of undeniably high lineage. His ancestors included the kings of Aragon and Sicily, the landgraves of Hesse, the dukes of Brabant and Saxony, and the counts of Nassau and Leuven. He and Elizabeth also shared a common ancestor in Henry II of England. He was "a senior Prince of the Empire" and a staunch defender of the Protestant faith. Frederick arrived in England on 16 October 1612, and the match seemed to please them both from the beginning. Their contemporaries noted how Frederick seemed to "delight in nothing but her company and conversation". Frederick also struck up a friendship with Elizabeth’s eldest brother, Prince Henry, which delighted his prospective bride immensely. King James did not take into consideration the couple's happiness, but saw the match as "one step in a larger process of achieving domestic and European concord". The only person seemingly unhappy with the match was Queen Anne. As the daughter of a king, the sister of a king, and the wife of a king, she also desired to be the mother of a queen. She is said to have been somewhat fond of Frederick's mild manner and generous nature, but simply felt that he was of low stock. On 6 November 1612 Henry, Prince of Wales, died. His death took an emotional toll on Elizabeth, and her new position as second in line to the throne made her an even more desirable match. Queen Anne and those like-minded who had "always considered the Palsgrave to be an unworthy match for her, were emboldened in their opposition". Elizabeth stood by Frederick, whom her brother had approved, and whom she found to have the sentiments of a fine gentleman. Above all, he was "regarded as the future head of the Protestant interest in Germany". The wedding took place on 14 February 1613 at the royal chapel at the Palace of Whitehall and was a grand occasion that saw more royalty than ever visit that court of England. The marriage was an enormously popular match and was the occasion for an outpouring of public affection with the ceremony described as "a wonder of ceremonial and magnificence even for that extravagant age". It was celebrated with lavish and sophisticated festivities both in London and Heidelberg, including mass feasts and lavish furnishings that cost nearly £50,000, and near enough bankrupted King James. 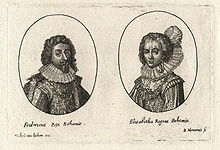 Among many celebratory writings of the events was John Donne's "Epithalamion, Or Marriage Song on the Lady Elizabeth, and Count Palatine being married on St Valentines Day". A contemporary author viewed the whole marriage as a prestigious event that saw England "lend her rarest gem, to enrich the Rhine". After almost a two-month stay in London for continued celebrations, the couple began their journey to join the Electoral court in Heidelberg. The journey was filled with meeting people, sampling foods and wines, and being entertained by a wide variety of performers and companies. At each place the young couple stopped, Elizabeth was expected to distribute presents. The cash to allow her to do so was not readily available, so she had to use one of her own jewels as collateral so that a jeweller would "provide her with suitable presents on credit". Her arrival in Heidelberg was seen as "the crowning achievement of a policy which tried to give the Palatinate a central place in international politics" and was long anticipated and welcomed. Elizabeth’s new husband transformed his seat at Heidelberg Castle, creating between 1610 and 1613 the Englischer Bau (i.e., English Building) for her, a monkey-house, a menagerie, and the beginnings of a new garden in the Italian Renaissance garden style popular in England at the time. The garden, the Hortus Palatinus, was constructed by Elizabeth's former tutor, Salomon de Caus. It was dubbed the "Eighth Wonder of the World" by contemporaries. Although Elizabeth and Frederick were considered to be genuinely in love and remained a romantic couple throughout the course of their marriage, problems already had begun to arise. Before the couple had left England, King James had made Frederick promise that Elizabeth "would take precedence over his mother ... and always be treated as if she were a Queen". This at times made life in the Palatinate uncomfortable for Elizabeth, as Frederick's mother Louise Juliana had "not expected to be demoted in favour of her young daughter-in-law" and, as such, their relationship was never more than cordial. Elizabeth gave birth to three children in Heidelberg: Frederick Henry, Hereditary Prince of the Palatinate (sometimes called Henry Frederick) was born in 1614, Charles in 1617, and Elisabeth in 1619. In 1619 Elizabeth’s husband Frederick was one of those offered the throne of Bohemia. Bohemia was "an aristocratic republic in all but name", whose nobles elected the monarch. It was one of the few successful pluralist states. The country had enjoyed a long period of religious freedom, but in March 1619, on the death of King Matthias, this seemed about to change. The Habsburg heir apparent, Archduke Ferdinand, was a fervent Catholic who brutally persecuted Protestants in his realm of Styria. The Bohemian nobles had to choose between "either accepting Ferdinand as their king after all or taking the ultimate step of deposing him". They decided on deposition, and, when others declined because of the risks involved, the Bohemians "pandered to the elector’s royalist pretensions" and extended the invitation to Elizabeth’s husband. Frederick, although doubtful, was persuaded to accept. Elizabeth "appealed to his honour as a prince and a cavalier, and to his humanity as a Christian", aligning herself with him completely. The family moved to Prague, where "the new King was received with genuine joy". Frederick was crowned officially on 4 November 1619. The coronation of Elizabeth as Queen of Bohemia followed three days later. The royal couple's third son, Prince Rupert, was born in Prague one month after the coronation. There was great popular rejoicing. Thus, Frederick's reign in Bohemia had begun well, but only lasted one year. The Bohemian crown ‘had always been a corner-stone of Habsburg policy’ and the heir, Ferdinand, now Holy Roman Emperor Ferdinand II, would not yield. Frederick's reign ended with defeat of Bohemian Protestant armies at the Battle of White Mountain (which ended the first phase of the Thirty Years' War) on 8 November 1620. Elizabeth is remembered as the "Winter Queen", and Frederick as the "Winter King", in reference to the brevity of their reign, and to the season of the battle. Fearing the worst, by the time of the defeat at the Battle of White Mountain, Elizabeth already had left Prague and was awaiting the birth of her fifth child at the Castle of Custrin, about 80 km (50 mi) from Berlin. It was there on 6 January 1621 that she ‘in an easy labour lasting little more than an hour’ was delivered of a healthy son, Maurice. The military defeat, however, meant that there was no longer a prospect of a returning to Prague, and the entire family was forced to flee. They could no longer return to the Palatinate as, despite the assistance of Elizabeth’s father, it was occupied by the Catholic league and a Spanish contingent. So, after a courteous invitation from the Prince of Orange was extended their way, they made their move toward The Hague. The Stuart princess, turned Electress, was now a queen in exile. Elizabeth arrived in The Hague in the spring of 1621 with only a small nucleus court, and the expectation was that it would be there that Elizabeth would remain for the rest of her life. Exile in The Hague, although relatively safe and comfortable, was not a particularly friendly or pleasant place to be and consequently, Elizabeth’s heart was never really in it. Nonetheless, Elizabeth’s sense of duty to assist her husband out of the political mess in which they had found themselves, meant that "she became much more an equal, if not the stronger, partner in the marriage". Her lady-in-waiting, Amalia van Solms, soon became involved with Frederick Henry, Prince of Orange and married him in 1625. The two women became rivals at the court of The Hague. Whilst in exile Elizabeth produced eight more children, four boys and four girls. The last, Gustavus, was born on 2 January 1632 and baptised in the Cloister Church where two of his siblings who had died young, Louis and Charlotte, were buried. Later that same month, Frederick said farewell to Elizabeth and set out on a journey to join the King of Sweden on the battlefield. Things for Frederick did not go as planned and, after declining conditions set out by King Gustavus Adolphus that would have seen the Swedish King assist in his restoration, the pair parted with Frederick heading back toward The Hague. Unfortunately, he never was reunited with Elizabeth. Since the beginning of October 1632 he had been suffering from an infection, and he died on the morning of 29 November 1632. He was 36 years old. When Elizabeth received the news of Frederick’s death, she became senseless with grief and for three days did not eat, drink, or sleep. When Charles I heard of Elizabeth’s state, he invited her to return to England; however, she refused. The rights of her son and Frederick’s heir Charles Louis "remained to be fought for". Elizabeth then fought for her son's rights, but she remained in The Hague even after he regained the Electorate of the Palatinate in 1648. She became a patron of the arts, and commissioned a larger family portrait to honour herself and her husband, to complement the impressive large seascape of her 1613 joyous entry to the Netherlands. Her memorial family portrait of 1636 was outdone however by Amalia van Solms who commissioned the Oranjezaal after the death of her husband Frederick Henry in 1648–1651. Elizabeth filled her time with copious letter writing and making marriage matches for her children. Her life after the death of Frederick, however, seems to have been fraught with heartache. Between his death in 1632 and her own death 30 years later, she would see the death of four more of her children: Gustavus in 1641, Philip in 1650, Henriette Marie in 1651, and Maurice in 1652. She would suffer another blow with the execution of her brother Charles I, King of England in early 1649, and the removal into exile of the surviving Stuart family during the years of the Commonwealth. The relationships with her remaining living children also became somewhat estranged, although she did spend time with her growing number of grandchildren. She began to pay the price for having been "a distant mother to most of her own children", and the idea of going to England now was uppermost in her thoughts. On the night of 20 June 1646 Prince Philip killed the French exile Lieutenant Colonel Jacques de l'Epinay, Sieur de Vaux, in a duel or fight. Rumours declared that the taunt which had provoked Prince Philip to murder had been a boast of the French Don Juan that he had enjoyed the favours not only of the Princess Louise, but also of her widowed mother. In 1660, the Stuarts were restored to the thrones of England, Scotland and Ireland in the person of Elizabeth's nephew Charles II. Elizabeth, now determined to visit her native land, arrived in England on 26 May 1661. By July, she was no longer planning on returning to the Hague and made plans for the remainder of her furniture, clothing, and other property to be sent to her. She then proceeded to move to Drury House, where she established a small, but impressive and welcoming, household. On 29 January 1662 she made another move, to Leicester House, but by this time she was quite ill. Elizabeth was suffering from pneumonia, and on 10 February 1662 she haemorrhaged from the lungs and died soon after midnight on 13 February 1662. Her death caused little public stir as by then her "chief, if not only, claim to fame was as the mother of Rupert of the Rhine, the legendary Cavalier general". On the evening of 17 February, when her coffin (into which her remains had been placed the previous day) left Somerset House, Rupert was the only one of her sons to follow the funeral procession to Westminster Abbey. There in the chapel of Henry VII, "a survivor of an earlier age, isolated and without a country she could really call her own" was laid to rest among her ancestors and close to her beloved elder brother, Henry, Prince of Wales. Under the English Act of Settlement 1701, the succession to the English and Scottish crowns (later British crown) was settled on Elizabeth’s youngest daughter Sophia of Hanover and her issue. In August 1714, Sophia's son (Elizabeth's grandson) George I ascended to the throne, with the future Royal family all his descendants and hence, also descendants of Elizabeth. The Elizabeth River in colonial Southeastern Virginia was named in honour of the princess, as was Cape Elizabeth, a peninsula, and today a town in the United States in the state of Maine. John Smith explored and mapped New England and gave names to places mainly based on the names used by Native Americans. When Smith presented his map to Charles I, he suggested that the king should feel free to change the "barbarous names" for "English" ones. The king made many such changes, but only four survive today, one of which is Cape Elizabeth. 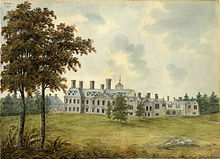 According to legend, William Craven, 1st Earl of Craven, built Ashdown House in Berkshire, England, in honour of Elizabeth, although she died before the house was completed. Polish baroque poet Daniel Naborowski wrote a short poem praising Elizabeth's eyes. He had seen her in 1609, when he visited London on a diplomatic mission. Scottish writer Nigel Tranter has Elizabeth appear in several chapters of his book The Young Montrose, about the life of his hero James Graham, 1st Marquess of Montrose. Elizabeth is a central character in Jane Stevenson's novel The Winter Queen (2003). The Winter Queen plays a seminal role in Neal Stephenson's The Baroque Cycle which is largely set during her lifetime. The young Elizabeth Stuart is the subject of Christie Dickason's novel The King's Daughter (2009). As the older, exiled Elizabeth of Bohemia, she also makes an appearance in Dickason's novel A Noble Assassin (2011). Elizabeth is a main character in Daniel Kehlmann's novel Tyll (2017). Chisholm, Hugh, ed. (1911). "Elizabeth (daughter of James I.)" . Encyclopædia Britannica (11th ed.). Cambridge University Press. Curran, Kevin (2006). "James I and fictional authority at the Palatine wedding celebrations". Renaissance Studies. 20 (1): 51–67. doi:10.1111/j.1477-4658.2006.00113.x. Jardine, Lisa (24 February 2013). "A Point of View: The Winter Queen of Bohemia". BBC Magazine. Kassel, Richard (2006), The Organ: An Encyclopedia, London: Routledge. Spencer, Charles (2008) Prince Rupert: the Last Cavalier, London: Phoenix. Wilson, Peter H. (June 2008). "The Causes of the Thirty years War 1618–48". English Historical Review. CXXIII (502): 554–586. doi:10.1093/ehr/cen160. Yates, Frances (1972), The Rosicrucian Enlightenment, London: Routledge and Kegan Paul, ISBN 0-7100-7380-1 , devotes its early chapters to describing her 1613 wedding and the reputation she and her husband had in Europe at the time. ^ M. S. Giuseppi, ed., Calendar of State Papers Scotland, vol. 11 (Edinburgh, 1952), p. 306. ^ M. S. Giuseppi, ed., Calendar of State Papers Scotland, vol. 11 (Edinburgh, 1952), p. 336. ^ Charles remained in Scotland for the time being, Margaret had died in spring 1600 and Robert in May 1602. ^ "Guy Fawkes and Bonfire Night". Bonfirenight.net. Retrieved 2013-02-13. ^ Curran, Kevin (2006). "James I and fictional authority at the Palatine wedding celebrations". Renaissance Studies. 20 (1): 51. doi:10.1111/j.1477-4658.2006.00113.x. ^ Jardine, Lisa (24 February 2013). "A Point of View: The Winter Queen of Bohemia". BBC Magazine. Retrieved 29 March 2013. ^ Wilson, Peter H. (June 2008). "The Causes of the Thirty years War 618-48". English Historical Review. CXXIII (502): 583. doi:10.1093/ehr/cen160. ^ Mariusz Górniak, Roman Mazurkiewicz. "Daniel Naborowski – Na Oczy Królewny Angielskiej, Która Była Za Fryderykiem, Falcgrafem Reńskim, Obranym Królem Czeskim". Staropolska.pl. Retrieved 2013-02-13. ^ "Tyll: A major new novel by Daniel Kehlmann". Retrieved 2017-12-07. Wikimedia Commons has media related to Elizabeth Stuart, Queen of Bohemia. "Archival material relating to Elizabeth Stuart, Queen of Bohemia". UK National Archives. This page was last edited on 29 March 2019, at 15:28 (UTC).